Here at Art on a Postcard, we are always so grateful for the extreme generosity of our artists not only for donating a postcard-sized work of art to help us raise money for The Hepatitis C Trust, but for the amount of time that they set aside to support us. This year we are delighted to be hosting our exhibition at WeWork in Devonshire Square. WeWork provides beautiful, collaborative work spaces offering ambitious businesses the space, community and services they need to thrive. Taking inspiration from WeWork we decided to meet up with some of the 170 artists who kindly donated work to this year’s Secret Auction to discuss their studio spaces and how it influences their practice. 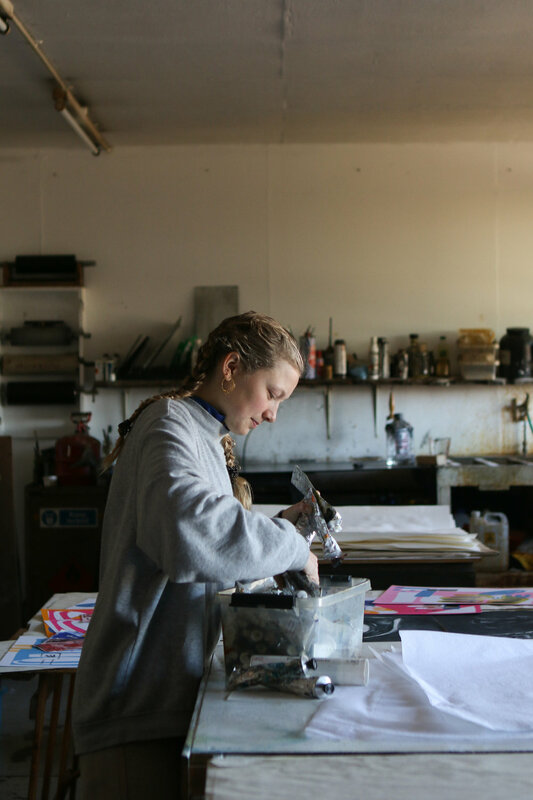 We met with printmaker Alice Irwin to discover what makes her studio so special. Alice Irwin is an award-winning RCA graduate, who is currently working on a show at the Yorkshire Sculpture Park. In 2017 she won the Contemporary Art Trust prize for a series of prints; she has recently exhibited at Flowers Gallery, Sid Motion Gallery, CGP London and East of Elsewhere in Berlin. Alice Irwin works in layers as a printer, and much of her sculpture is created from a printer’s perspective. She pushes the boundaries of art and craft, combining the traditional and the new. Irwin aims to convey the innocence we possess as children but also to express the message of human identity; she wants some aspects of her work to be playful, naïve and comical while others are more thought-provoking. Her work offers contrasts: some parts are tactile; others create kinetic experiences in the mind. These contrasts are designed to stimulate different kinds of memory. How would you describe your studio? There are lots of different things going on in my studio as I work on a number of different things at the same time. I have work in progress pinned up as I don’t like to keep it in books, and I like to be able to constantly refer back to my thoughts. There are lots of drawings as this is a crucial starting point for me for everything I make. I also always have a word association list pinned up which I can come back to. How does your personal environment affect your creative practice? The studio is a place where I can get all my ideas out and know they are in a safe place. I get a lot of my inspiration from being around people and experience from the everyday, so I find that the situations I am in effect the ideas I am working on. What makes a good space to create art in? That’s a difficult question because different situations offer different inspiration, but, as I mentioned above, I like a space where I can have my drawings and ideas pinned up and then let the stories of the work take shape. View all the works donated to this year’s Secret Auction here.